This is a HUGE pillow.It measures approximately 30.7 inches by 55 inches.It will take up almost half of a big bed. Your body pregnancy pillow comes in a vacuum-sealed plastic.You will either need to pat & shake it lightly for the pillow body or let it sit for several hours so the air will cause the pillow to rise. The Patented Feature allows you to adjust your back Support Zones and Headrest by shifting the fills inside, shaping the pillow to customize the support of human natural curvature, maintaining your head and back in comfortable position while in sleep. You can further adjust the firmness of the pillow by adding or removing the fills through the zipper at the bottom of the pouch. 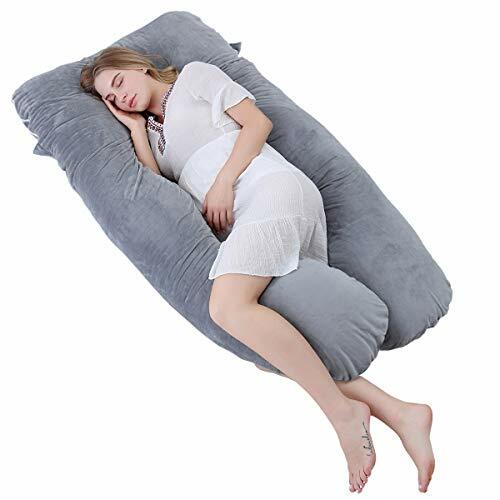 Cradle yourself in this U shape maternity pregnancy pillow, which has two supportive "legs" allowing you to sleep on your side or on your back, sitting up or lying down, the comfortable body support pillow allows you to stretch out and cradle your entire body in support and comfort. ♥♥♥PREMIUM FILLING MATERIAL - Filling: This extra soft, adjustable and scent free 7D hollow fiber filling, provides comfort for side sleeping and retains fluffiness for better performance and longer use. Inner Cover: The improvement brushed fabric is more durable. Outer Cover: This comfy cotton cover with double zippers is hypoallergenic and machine washable. ♥♥♥SUITABLE FOR EVERYONE-The unique design follows the shape of human body, which is an over-sized U-shape, and is long enough for you to stretch out and support both sides of your body. This pillow is not only for pregnant mothers, but it is also comfortable for everyone who is eager for a better sleep. ♥♥♥VERSATILE & MULTIFUNCTIONAL USAGE - This body pillow is very suitable for back sleeper, side sleeper and stomach sleeper. Creates a relax & comfortable position for sleeping, reading, nursing, watching TV etc. The total body shaped of this pillow provides a painless and sweet sleep. Great gift for expecting mothers. ♥♥♥DEEPLY SLEEP EVERY NIGHT: - This pillow is ideal for sciatica relief, relief of leg swelling and back pain, prevents pressure on the liver, prevents hypertension syndrome, eliminates tossing and turning; As well as helps support the head, back, belly, sides, knees, hip and feet. People may experience varying results. ♥♥♥100% SATISFACTION GUARANTEED: Customer satisfaction is our top priority!!! If you are not satisfied with the maternity pillow or any issues, we will refund for you within 30-day. View More In Body Pillows. Solid Pattern 800 Thread Count 100% Egyptian Cotton One Pair Body Pillow Cover 20"x 60" Size & Navy Blue Color.